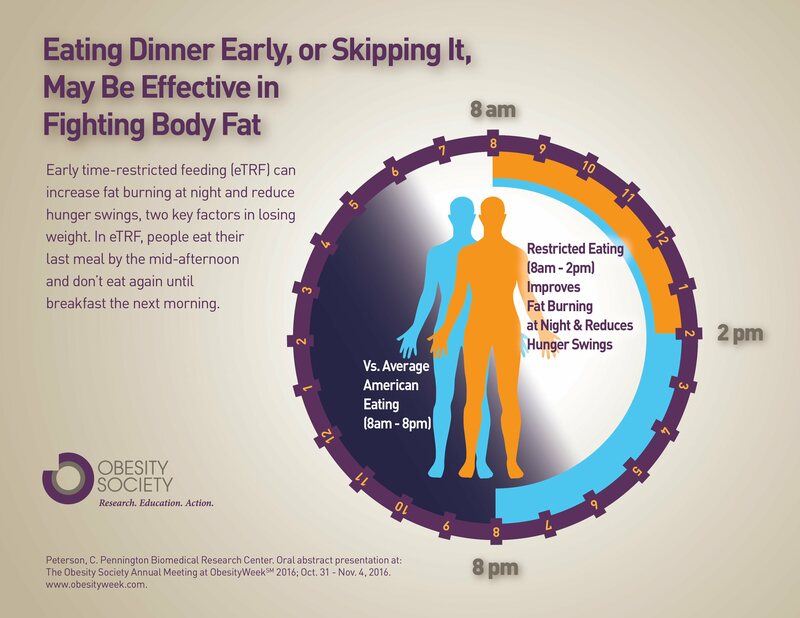 NEW ORLEANS, LA--(Marketwired - November 03, 2016) - The first human test of early time-restricted feeding found that this meal-timing strategy reduced swings in hunger and altered fat and carb burning patterns, which may help with losing weight. In early time-restricted feeding (eTRF), people eat their last meal by the mid-afternoon and don't eat again until breakfast the next morning. The findings were unveiled during an oral presentation today at The Obesity Society Annual Meeting at ObesityWeek℠ 2016 in New Orleans, Louisiana. "Eating only during a much smaller window of time than people are typically used to may help with weight loss," said Courtney Peterson, PhD, who led the study at Pennington Biomedical Research Center. "We found that eating between 8 am and 2 pm followed by an 18-hour daily fast kept appetite levels more even throughout the day, in comparison to eating between 8 am and 8 pm, which is what the median American does." This new research, funded by a TOS Early Career Research Grant awarded in 2014, suggests that eating a very early dinner, or even skipping dinner, may have some benefits for losing weight. The body has a internal clock, and many aspects of metabolism are at their optimal functioning in the morning. Therefore, eating in alignment with the body's circadian clock by eating earlier in the day can positively influence health, and this new study of eTRF shows that this also applies to metabolism. This first test of eTRF in humans follows rodent studies of this approach to weight loss, which previously found that eTRF reduced fat mass and decreased the risk of chronic diseases in rodents. To conduct their study, Dr. Peterson and colleagues had eleven men and women who are overweight eat between 8am and 2pm (eTRF) for 4 days or eat between 8am and 8pm for 4 days. The researchers then tested how eTRF affects calories burned, fat burned, and appetite. To eliminate subjectivity, the researchers had all the participants try both eating schedules, eat the same number of calories both times, and do rigorous testing under supervision. The researchers found that although eTRF did not affect how many calories participants burned, it reduced daily hunger swings and increased fat burning during several hours at night. It also improved metabolic flexibility, which is the body's ability to switch between burning carbs and fats. Whether eTRF helps with weight loss or improves other aspects of health is still unknown. "These preliminary findings suggest for the first time in humans what we've seen in animal models -- that the timing of eating during the day does have an impact on our metabolism," said Dale Schoeller, PhD, FTOS spokesperson for The Obesity Society and Professor Emeritus at the University of Wisconsin. "With additional research on early-time restricted feeding on humans, we can create a more complete picture of whether this innovative method can help prevent and treat obesity." Find additional information and the full abstract here. The Obesity Society (TOS) is the leading professional society dedicated to better understanding, preventing and treating obesity. Through research, education and advocacy, TOS is committed to improving the lives of those affected by the disease. For more information visit: www.Obesity.org. Connect with us on social media: Facebook, Twitter and LinkedIn. Find information about industry relationships here. ObesityWeek is the premier, international event focused on the basic science, clinical application, prevention and treatment of obesity. TOS and the American Society for Metabolic and Bariatric Surgery (ASMBS) host the world's pre-eminent conference on obesity, ObesityWeek 2016, Oct. 31 - Nov. 4, at the Ernest N. Morial Convention Center in New Orleans, Louisiana. For the fourth year, both organizations hold their respective annual scientific meetings under one roof to unveil exciting new research, discuss emerging treatment and prevention options, and network and present. Connect and share with ObesityWeek on Twitter and Facebook, or by using #OW2016. "Eating dinner early, or skipping it, may be effective in fighting body fat"